While we all love Jordan almonds or a new wedding koozie, sometimes it's fun to receive a more inventive wedding favor. If you're looking for a way to thank your guests for being a part of your big day, these Charleston wedding favors fit the bill! From scented favors that evoke the gentle breezes of the Lowcountry to tasty treats made in the Charleston area, you'll be able to send a little piece of your Holy City celebration home with your guests to savor. Let the sweet times continue by tucking little jars of honey into your guests' hand. You can find locally produced honey from a variety of farms here in the Lowcountry, including Oakley Honey Farms in Moncks Corner, Blue Pearl Farms in McClellanville, Charleston Bees and Honey in West Ashley, and Bee City in Cottageville. It's one thing that all Charleston residents need to have, so gift your guests their own oyster knifes, and they'll be ready when you invite them to your new house for your oyster roast housewarming party! For a special touch, have the oyster knives engraved with your wedding date or monogram. Local shops such as Carolina Girls, Charleston Shucker Co., or Coastal Knives can help you with the details. 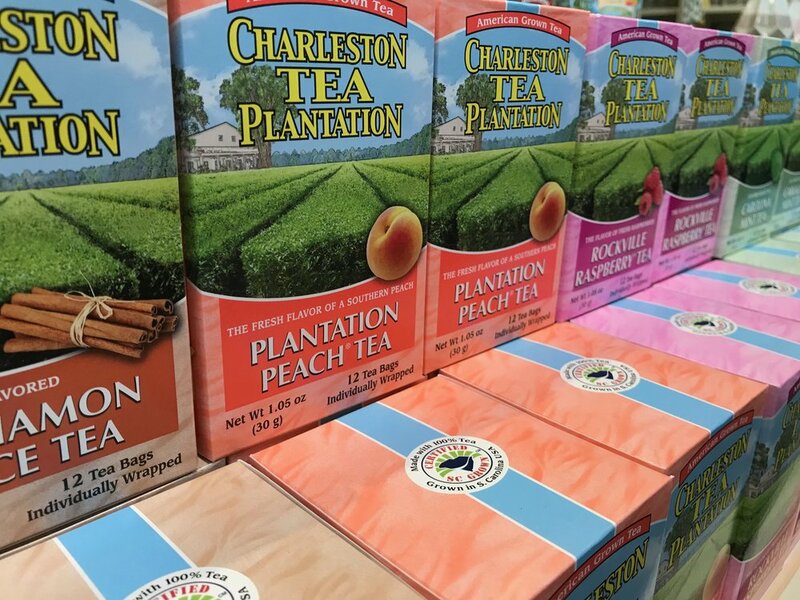 Charleston is home to the only tea plantation in North America, which is quite fitting given the amount of sweet tea its residents consume on a daily basis. With flavors such as peach, cinnamon, and green tea, your guests will be able to find the perfect flavor to quench their thirst. You can purchase online, at the plantation store on Wadmalaw Island, or at many local gift shops (including downtown at the City Market). Rooted in the African culture that the slaves brought to the Lowcountry, the benne wafer ("benne" being the Bantu word for "sesame") is now a beloved treat in the South Carolina Lowcountry. The paper thin wafers are crunchy thanks to the toasted sesame seeds mixed in, and their sweet-nutty flavor will have your wedding guests dreaming of their next trip to Charleston. You're most likely to run into bags of these tasty snacks that were baked by Olde Colony Bakery or Charleston's Own, though there are other local companies who produce them. Find these at local stores like Boone Hall Farms, the City Market, and local Harris Teeter stores. Made from the sweetgrass that grows in the marshes all over the Lowcountry, these long, thin grasses are twisted into a rose shape and secured with a rubber band. We recently attended a Charleston wedding where these were the favors and loved the idea. Now, every time your guests see their sweetgrass rose (which won't ever wilt or die! ), they'll be reminded of your beautiful day. By these from one of the many talented sweetgrass basket makers in and around the Charleston area. You'll find a particularly large concentration of sweetgrass artisans on Highway 17's Sweetgrass Basket Corridor. Scent is one of the most powerful ways to evoke a memory, so send your guests home with the tantalizing smells of Charleston. Wicked Candles is a small company offering a variety of scents including a series named after Folly Beach, Marion Square, Botany Bay, and other areas in Charleston. The team over at Rewind has been repurposing wine bottles into richly scented wine-themed candles since 2009. 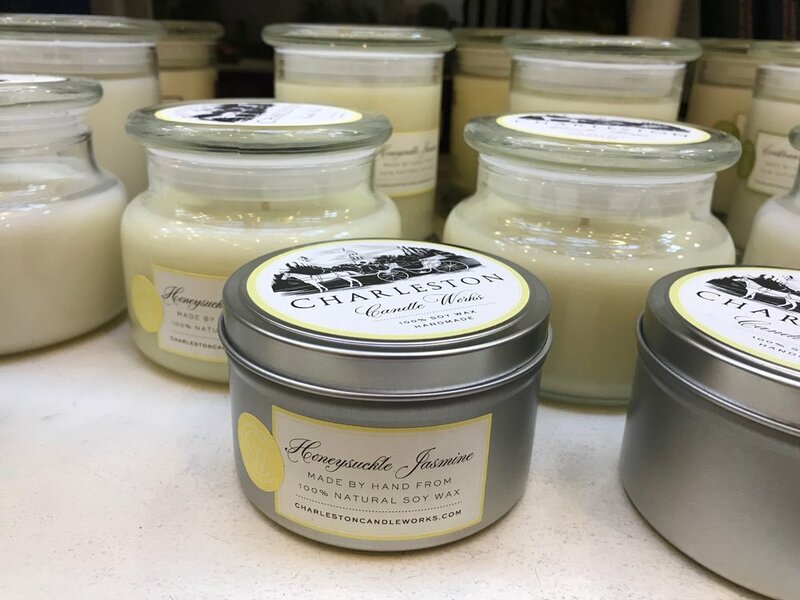 Charleston Candle Works offers up candles in beautiful packaging in a variety of scents like Avenue of Oaks, Plantation Gardens, and Summerville Rain. While the candles aren't made in Charleston, Archipelago Botanicals makes a popular floral candle that showcases some of the flowers found in this area. Whether you prefer them with a dollop of butter or piled high with blackened shrimp, grits are the go-to breakfast and brunch item in Charleston. Let your guests take some of that Lowcountry flavor home with them. 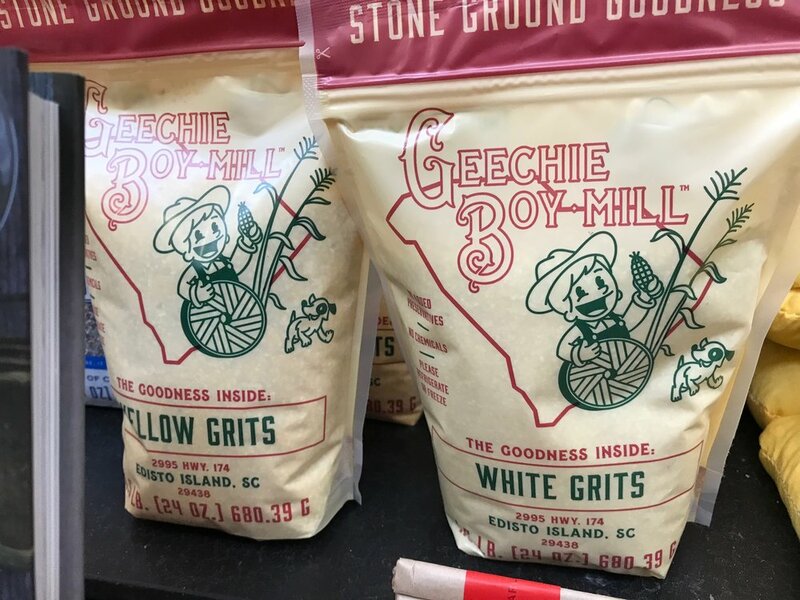 Geechie Boy Mill on Edisto Island offers up some freshly ground grits that would make for easy favors for a rustic get-together. To have and hold...and to hang up in your house! Tuck a detailed painting or drawing of the Holy City into the thank you baskets for a gift that your guests will love looking at over and over again. We love the watercolors by Studio R for their bright colors and ability to perfectly capture the Lowcountry vibe. Remember the sweetest day of your life with some sweets made just for you. Reach out to Bullfish Cookie Company in Charleston or Bakies in Mount Pleasant to get custom sugar cookies decorated with your wedding colors, your monogram, or a cute icon. If variety is the spice of life, then Charleston has the market cornered with everything there is to see and do in the Holy City. And what better way to celebrate what the Lowcountry has to offer than a container of fresh-from-the-sea salt? Bulls Bay Salt Works pulls sea salt from the titular Bulls Bay (located just north of Mount Pleasant) and extracts it with solar powered equipment here in Charleston. The result is a flavor unlike anything you (or your guests) have ever tasted, and would be a great way to leave them with a taste of your wedding memories. We wish that it was possible to bottle the smell of pluff mud and salt air (we're weird like that), but until that becomes possible, the fragrances of Charleston Botanicals is a fantastic option. The microperfumery produces scents with Charleston themed names like Carlopolis (named after a preservation award) and Annabel Lee (an ode to Edgar Allan Poe, who was stationed at Fort Moultrie on Sullivans Island). While they don't have an online shop, you'll find their wares at various boutiques across the Lowcountry. And we're not talking about the ghosts that are rumored to haunt every corner of the Holy City, either. Charleston Distilling Company produces Vesey's Straight Bourbon using South Carolina grains; try a sample at their tasting room on King Street. William Wolf Whiskey has exciting flavors like pecan bourbon and coffee whiskey. High Wire offers a variety of spirits including gin, rum, and whiskey, all of which are created on Upper King. Try the spiced rum or moonshine over at Striped Pig. For a great twist on your sweet tea, try the Firefly Sweet Tea vodka. Give your guests' taste buds a kick that they'll never forget with this incredibly flavored olive oil. This bacony, peppery oil can be used in everything from cake recipes to salads. Tuck a little bottle into your guests' hands before they leave, and they will be hounding you for an invitation back to Charleston. Check out their booth at the Charleston Farmers' Market, pick up a bottle at Publix, or order online.